Breast cancer is the most common cancer in the UK. Following medical intervention approximately 20% of breast cancer patients suffer lymphoedema. After breast cancer, a person may experience psychological or emotional difficulties due to altered body image, and a swollen limb can exacerbate this (Mackereth & Carter 2006). Research suggests that survivors with lymphoedema are more disabled, and they experience a poorer quality of life and more psychological distress than survivors without lymphoedema, (Bernas et.al.2010, Pyszel et.al. 2006, Ridner 2005). There is a need for more effective interventions and further research into a range of physical therapies for the management of lymphoedema. Reflexology is a physical therapy focusing on the feet. Practitioners use specific pressure with thumb, finger and hand techniques to stimulate these reflexes on the premise that this effects a physical change in the body. Anecdotally, cancer patients suffering from lymphoedema report positive effects on the swollen arm after reflexology treatment. 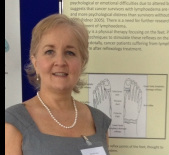 To explore the use of the RLD (reflexology lymphatic drainage) technique as a precision treatment for the reduction of lymphoedema, swelling of the arm following treatment for breast cancer. As part of an undergraduate project, six participants with unilateral secondary lymphedema were recruited from a South Wales cancer-care organization. The participants received four consecutive weekly reflexology lymph drainage (RLD) treatments. Limb Volume Circumferential Measurement (LVCM) was the primary outcome measure used. This method is widely used for calculating arm volume (NHS 2008). Measure Yourself Concerns and Wellbeing (MYCaW), was used to gather subjective data (Patterson et.al. 2006). LVCM and MYCaW measures were taken at baseline, the intervention stage, and at follow-up (one week post-intervention). Positive trends were observed on both outcome measures for all six participants. As a group, the results indicated a statistically significant reduction in arm volume, from baseline to follow-up (t=6.93, df=5, p=0.001) on LVCM. MYCaW mean profile scores from baseline to follow-up, also showed a significant improvement (Z=-2.207, p=0.027). The results were also supported by the qualitative data reported by participants. Conclusion: Findings of this exploratory study suggest that RLD may be helpful in the management of secondary lymphoedema. A more robust research design is needed to test for a causal link between the application of reflexology and possible outcome benefits. Further research is planned for 2013, following a successful funding bid in partnership with Cardiff Metropolitan University. The proposal aims to replicate the methodology used in the exploratory study and increase the number of participants (n=30). Providing the results of this are comparable to the initial trial, a large scale, multi-centre randomised control trial (RCT) will be justifiable.